Good Choice Reading: Taylor Swift, National Book Awards, ALL HALLOW'S READ and more! Taylor Swift, National Book Awards, ALL HALLOW'S READ and more! Taylor Swift Donates 6,000 Books! On Thursday, October 13, it was revealed that Taylor Swift had donated 6,000 books to local libraries in Reading, Pennsylvania. Partnering with Scholastic, Taylor allowed local librarians to choose the books, but they were all for children and young adults. In a statement, she said that she wants to help economically troubled libraries. Every book donated by Taylor will feature a white star on its spine - in hopes that this will encourage children to pick up the books and read. Way to Go Taylor Swift!! Tea Obreht, "The Tiger's Wife"
Julie Otsuka, "The Buddha in the Attic"
Jesmyn Ward, "Salvage the Bones"
Debbie Dahl Edwardson, "My Name is Not Easy"
Thanhha Lai, "Inside Out and Back Again"
Albert Marrin, "Flesh and Blood So Cheap: The Triangle Fire and Its Legacy"
Congratulations to all the Finalists!! October is National Book Month!! So October is National Book Month AND National Cookie Month - who knew?? 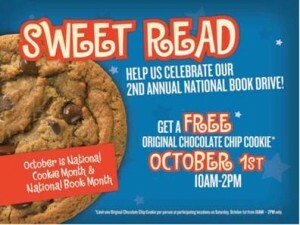 Starting October 1st, Great American Cookies has been holding their 2nd Annual National Book Drive. If you go into the store and donate a new or gently read book any day in October, you will receive one free cookie of your choice!! So support a good cause and go eat a cookie!! Public Bookshelves All Over Germany! All around Cologne, Germany right now, public bookshelves are going up. Yep...you read right - public bookshelves. Browse the books...take a book....leave a book...no due date, no hassles, and no restrictions. Michael Aubermann, one of the organizers, stated, "This project is aimed at everyone who liked to read -- without regard to age or education. It is open to everybody." The bookshelves are funded with donations and kept up by volunteers. Each bookshelf holds about 200 books and it takes about 6 weeks for every single title to turnover into 200 entirely new titles. We should get some public bookshelves around here! That would be amazing!! On Tuesday, October 25th give the gift of dread! HarperTeen is joining Neil Gaiman to celebrate the new holiday tradition of scary book giving during the week of Halloween. On Tuesday, October 25th HarperCollins Children's Books will be dropping scary books throughout various locations in New York City to celebrate All Hallow's Read. Follow @HarperTeen, @EpicReads, @PitchDarkBooks, and @HarperChildrens as we tweet pictures and clues to discover scary reads around the city! Join in the fun and give a book of your own! Photograph and share your drops on 10/25 using the #AllHallowsRead hashtag. For more information check out this video from Neil Gaiman explaining how you can get involved in All Hallow's Read and visit AllHallowsRead.com for book recommendations and downloadable extras. Taylro Swift and Neil Gaiman are true heroes! Thanks for sharing the public shelves idea. Those are some awesome announcements! I am giving someone a scary book for halloween already - but it makes me feel good knowing I'm participating in what will hopefully become a new tradition - at least among book readers!